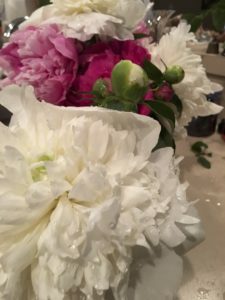 It is fall and I have missed 3 months of blogging due to health issues and realizing my limitations and learning what I can and can’t do. 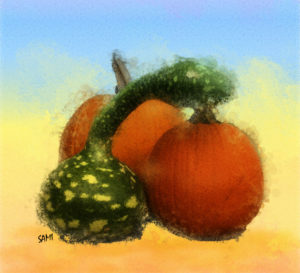 The featured image this week is a grouping of pumpkins that I fell in love with and had to paint. This week we will talk about limitations and concussion traumatic brain injury and hidden visual problems. This week we have been having lots of rain and the flowers and vegetables are looking beautiful. The featured image this week is my fountain with the garden of flowers and mint around it. The little wren sits outside my studio window and sings her energetic bubbly song and reminds me that this is summer. Certainly the temperatures in the 50s don’t remind me of summer. This week we will talk how easy it is to become a vegetarian and what’s new in the garden and I have a fun, very simple rice recipe for you. This week the peonies are blooming and Black Locust trees are in full bloom with the air fragrant with the smell of Jasmine as that is what the black locust tree blooms smell like. A friend sent me the featured image picture with the wonderful details of their smell. 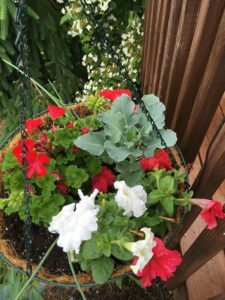 My hanging baskets are becoming lush with the plants and my tomatoes are blooming. I love that the companion planting is keeping the vegetables free from bugs. Your garden can be environmentally friendly and healthy for you and the earth. The chipmunks are sharing my strawberries but there were plenty for a small dish for supper with my salad from the garden and a small bowl for a friend and the raspberries are in full bloom. Spring and summer renew us with the joy of rebirth and growing things. We don't always have the ability to have health - and life happens - but it is how we manage those events that gives us a healthy, wellness lifestyle. I will share how I see wellness and how I have used it during the good and difficult times.